Are you ready to throw up your hands in disgust over the look of your lawn? Well, me too. Even with irrigation my fescue lawn looks like toast. Well, actually, not all the lawn–the parts that get shade from the house or trees actually look pretty good. But the turf that’s in full sun looks like straw. August 13-14 – Apply Roundup to all the areas of the lawn you wish to reseed. This will kill off the crabgrass, sedge, henbit and all the other nasty weeds that are taking over. And use Roundup or a generic that has exactly the same ingredients. Some ‘quick kill’ products only burn the surface foliage and do not effect the root systems. The weeds will come back. Roundup, by contrast, is metabolized by the plant and will kill it totally. Give it 8-11 days to get complete results. Got bermuda (or wire grass) in your lawn? Plan to make a second roundup application in two weeks and delay the rest of the renovation schedule by two weeks. Contact Raleigh and ask for permission for daily watering to establish a lawn. They should grant it without problem. August 29-31 – Reserve a ‘dethatcher’ and/or ‘slit seeder’ from an equipment rental company (Home Depot on Six Forks, Capital Rental, United Rental, Grand Rental Station, etc.) A dethatcher is a gasoline powered device about the same size and weight as an aerator. It has a rotating bar with rake blades that will scrape up all the vegetation in its path. An aerator has a rotating bar with pipes on the end that pull out 1/2 diameter cores of ground. A slit seeder is the same size as the dethatcher and has rigid splines that cut small furrows into the ground into which little tubes drop seed as you go. A clever concept but complicated and prone to malfunction. The cost for renting these will run from $50 to $150. Sept 3-4 – Now the real work begins. Your Round-up treated lawn should be totally dead. Unload the dethatcher (it’s heavy-you’ll need a truck and two people). Make two passes over the lawn, the second at 90 degrees to the first. The dethatcher has brought up all the dead foliage and ‘thatch’. You will now need to hand rake the entire area to get this material out of the way between you and the ground. Set it on the driveway–you will need it again later. Add fertilizer with a drop or rotary spreader. Use something near the ratio of 14-24-04. If your ground is compacted (heavy walk zone, cars parked, haven’t done it in 3 years) then aerate. Now apply you seed. Use a drop spreader or, prefereably, hand cast. DON’T USE A ROTARY SPREADER or you will be picking grass out of your flower beds for the next year. Hand casting give you the best control, especially around beds and curbs. Now you have an option: cover the seeded area with wheat straw (you’ll need one bale per 500 square feet. The draw back is that next spring you will have hay grass growing (faster and taller) in your yard the first of Spring. It will die off by June. If this bothers you (it does me), then forego the hay and use the thatch (remember, the stuff you raked up and set on the driveway). The thatch will accomplish the same purpose: hold moisture in, hide the seed from hungry birds and add humus (organic matter) to the soil (it needs this). The final step: just add water for your instant lawn. Sept 5-19 – Well, not quite instant. It will take 14 days for the fescue seed to germinate. You will need to water as often as possible to keep the seed moist. If you have an automatic irrigation system, set it for 3 times a day: 5am, noon, and 4 PM. Set the seasonal adjustment to 40%. This will spritz the lawn and keep the soil moist. Sept 20-26 – Cut back watering to once per day, three days per week. Sept 27-October 31 – Cut back watering to once per day, two days per week. October 15 – You may mow your lawn. Keep it high (no less that 3 1/2 inches) and cut off no more than 1/3 of the blade length. August 20-21 – Cut out your old sod and use it to berm up beds or elsewhere on you property at ‘fill’. Spread the sand over the entire area using a wheel barrel to get it into piles, then rake it as evenly as you can. You will need help for the next step. Get a 1 x 4″ board, roughly 12′ long and straight along its edge, and slide it moving back and forth to screed the sand so that it is perfectly level. Do this for the entire are where sod will go. If you have time, go ahead and set your sod. If not, wait till the next weekend. August 27-28 – Your sod has arrived and you are now ready to lay it out. Make sure your sand is still screeded perfectly level. With a spray nozzle set to fine mist, moisten the sand. Set the sod out like carpet tiles, making sure that the edges touch and that the sod is lying perfectly flat. As you go to the next row, overlap the joints of the previous row (so it looks like a running bond pattern with brick) use a hard blade edger to cut the excess sod from overhanging beds and curbs. Once you’re done, soak the sod again, be careful to stay off of it as you water soas not to make depressions. August 29 – September 3 – Water daily to ensure that the sod has good contact with the ground and is setting roots. After this time, cut back the watering to three times a week. What am I going to do? I guess both. I’m switching to Zeon Zoysia in the front corner and overseeding my fescue on the sides. What are you going to do? That’s up to you. Choose one, the other or both. But choosing ‘None’ is not an option. If you’re not sure about all of this and want a second opinion, here’s an article from Dr. Grady Miller of NC State on the subject. The US Drought Monitor of North Carolina (http://www.ncdrought.org/)currently has approximately two-thirds of the entire state in some level of drought. The southeastern part of the state is currently under extreme drought. Worsening the problem is the above average temperatures. High temperatures cause cool-season grasses like tall fescue to photorespire. This results in a heavy energy toll on the plant. Heat alone is generally not problematic with warm-season turfgrasses unless there is low soil moisture. There are two current issues to consider: irrigation to maintain your current grass and renovation of cool-season turf areas this fall. Depending on your irrigation capacity and current level of irrigation restrictions you caneither irrigate to maintain growth and green color or irrigate for turfsurvival, allowing the turfgrass to go semi-dormant to dormant. Turf survival under drought conditions is affected by turfspecies, turf age,rooting depth, soil type, shade, maintenance, traffic, heat, etc. Commonrecommendations indicate that turf this time of year needs approximately 1 inch of water per week from irrigation or rainfall. Thisis an approximate amount to irrigate if you want to keep the turf greenand growing. Set your controller to water between 10:00 pm and 8:00 am to improve efficiency. If you pull water from a city water system and have low water pressure, it is typically better to water at night ratherthan early morning when the water demand is high. Check your irrigationsystem for evenness of distribution and put out a few catch containers to verify the application rate (amount). 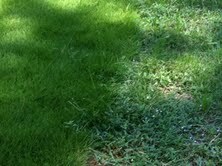 You can fine tune the application by not watering again until you see turf turning bluish-grayin the heat of the day. If you are under water restrictions, then you may need to hand water those areas that show visual signs of heat and moisture stress until your next allowed irrigation. If you decide to minimally water, then use ½ inch of water every two to four weeks to keep the turf crowns hydrated. This amount will not turn the turf green, but it will increase its chance of survival. Avoid herbicides and fertilizers until rains resume. Also, keep vehicle traffic (e.g., riding mowers) off the turf when it is under severe drought stress. If you have not irrigated nor received any rainfall in months, the turf stand will likely be severely thinned this fall. The normal time for fall renovation of tall fescue or tall fescue/Kentucky bluegrass lawns in most of NC is early September. So, ifyour yard is currently thinned due to drought stress, the period of time to begin renovation is just several weeks away. Hopefully by then we will be back in a more normal rainfall pattern and a fall renovation will have your landscape looking as good as new. If you have a warm-season grass such as zoysiagrass, bermudagrass, centipedegrass, or St. Augustinegrass, they will generally be able to handle dry conditionsbetter in terms of survival, but they may still be severely damaged from chronic drought. The time to renovate warm-season grasses is normally in spring/summer. Once temperatures begin to subside, you may see some recovery this fall. Note that warm-season grass sod can be installed in fall, although it may be more susceptible to winterkill. 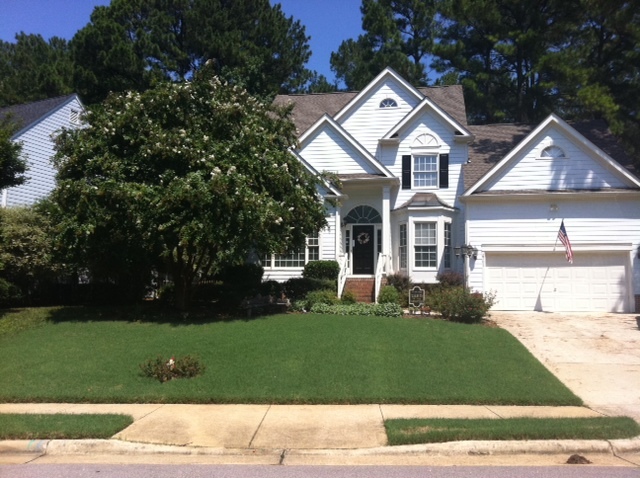 Yard of the Month for July is awarded to Patricia Conroy of 2701 Iman Drive. The manicured shrubs and rich green lawn show that this owner takes pride in her yard’s appearance. The judges have noted how good a Bermuda lawn looks this time of year as Patricia has finished in the top three for the last four months. Runner up for July and second place for two months in a row is Sandra Yarnall of 8613 Averell. Despite the heat, Sandra’s fescue lawn looks great. Finishing third and new to the top three is Carey Bitterfield of 8524 Yucca Trail. For tips on how to get your lawn looking great, check out the post “Time to Renovate”. Congratulations to the homeowners and thanks to Jen Magee, Bill Pappas and Mimi Raub who served on the judging panel.